We have a new DIY ART reclocking tutorial that can be found HERE. The ART rack effects range from the late 80's and early 90's were an odd selection of units. Not odd in the sense of being strange and interesting, but more in the sense of why there were so many of them, and what the hell was wrong with the people in the ART graphic design department at the time? Even under the 'multiverb' name there was the Multiverb, Multiverb Alpha, Multiverb Alpha SE, Multiverb EXT, Multiverb LTX, Multiverb LT and Multiverb III. Then there was the Proverb and the Proverb 200, and the guitar range with the SGE, SGE machII, SGX 2000, SGX T2 SGX Nitro, SGX LT etc etc. The list is endless. What is quite strange is that having opened up a few of these units we've come to the conclusion that lot of them are absolutely identical, just with a different OS chip onboard. Several of the Multiverbs and the Proverbs share exactly the same motherboard. 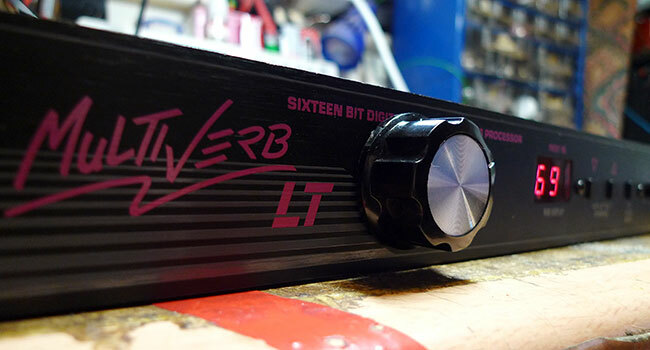 This particular model is the Multiverb LT. It features 189 effects presets including a wide selection of incredibly grainy reverb and delay, along with a few modulation effects such as chorus and flanging. You can find the manual HERE if you want to see the full effects list. Theres stereo in/out, a midi input, a couple of patch selection buttons, a wet dry mix slider, and thats about it. Unless you are specifically in the market for some very restricted bandwidth dirty reverbs, theres not really much reason to own any Multiverb these days, but thats when our simple reclocking mod comes in. Much like our Fostex DE1 mod, this mod adds a knob that controls the clock speed of the whole system. This actually gives you better quality effects when its set to a higher clock speed than normal, but its when you slow down the processing speed that the fun starts. Slowing down the system extends reverbs into massive washes of sound, delays become bit crushed alien noise and flanging turns into a wall of slowing undulating twang. You can actually use this unit purely as a kind of bit crusher, as slowing down the clock rate also seems reduce the bit rate of the audio processing. Setting the effects mix to 100% wet on a non reverb patch, and then slowing down the clock to its lowest setting chews up audio like its been through a sampler with stretching algorithms designed by a guy who has never even heard of sound, let alone sampling! Inevitably slowing down the clock means that unit responds to patch changes a lot slower, and even on patches with no delay effects, you will start to get a delay between the input and the output audio. On the plus side this does give you the chance to morph other effects into delay effects, and gives effects designed as delays a lot longer delay times. To hear some demos of this unit processing audio, take a listen to the soundcloud demos below. The second ART effects unit we've modded is the Proverb 200. This one is a bit odd, as in terms of hardware it is more or less identical to the Multiverb LT above. It uses exactly the same motherboard, the same controls and the same front panel. The only differences appear to be the front panel graphics, the operating system chip and the fact that it has a instrument / line level switch on the back. The pin header for this switch is also found on the Multiverb LT board, so presumably it could be fitted to that unit fairly easily. The Proverb 200 has all the effects available on the Multiverb LT, but also has the addition of some extra stereo imaging, delay, chorus and combination 'special' effects that may include some kind of pitch shifting. These extra effects would appear to be contained entirely in the different OS chip, so theres every possibility that you could upgrade a Multiverb or similar unit to a Proverb 200 simply by swapping the OS EPROM. We haven't tried this, but this page will be updated as soon as we can give it a go. This unit has the same reclocking mod installed on it. It can produce all of the effects in the Multiverb LT demos above, plus some further sound mangling options you can hear in the demo below.